Missouri S&T student Katie Frogge in the cockpit of the Boeing T-X. She was among the first members of the public to view the new jet. Boeing photo. A Missouri S&T student recently became one of the first members of the public to get an inside look at the cockpit of a new Boeing aircraft and to test its advanced training system. Katie Frogge of Lee’s Summit, Missouri, a sophomore majoring in aerospace engineering at Missouri S&T, was one of five students from universities and high schools in the St. Louis area to recently visit Boeing’s St. Louis location to experience the company’s T-X aircraft and pilot training system. The training system was designed specifically for the U.S. Air Force with future generations in mind, according to a Boeing news release, and the T-X cockpit features a simple layout, better visibility, stadium seating, an upfront controller display and a large area touchscreen display. 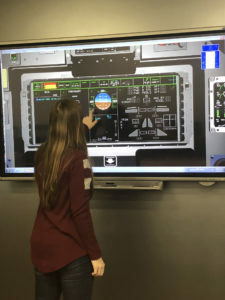 Katie Frogge tests the digital touch screen in the T-X Classroom at Boeing’s St. Louis facility. Boeing photo. During the Jan. 24 visit to Boeing, Frogge and her fellow students also toured a classroom, which features desktop trainers and interactive displays, and flew what Boeing calls “the real-as-it-gets” ground-base training simulator while guided by a former T-38 pilot instructor. They then had the opportunity to climb into one of the jets with Boeing T-X chief test pilot Steven “Bull” Schmidt. The Boeing T-X advanced pilot training system includes trainer aircraft, ground-based training and support. Her love of aviation led Frogge to choose aerospace engineering as her major. Frogge’s visit to Boeing was arranged by Carl Schmitz, Boeing’s engagement focal to Missouri S&T and the company’s warehouse systems IT manager. 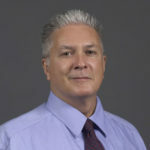 Schmitz earned a bachelor of science degree in information science and technology from Missouri S&T in 2010 and is a member of the Dean’s Leadership Council for S&T’s College of Arts, Sciences, and Business. He also serves on the board of directors for Missouri S&T’s Miner Alumni Association.